A few days ago, when we moved some cows, I took Lucas along. Always my “short go” dog, I hoped it wouldn’t be too much for him. We did some work on foot, turning the cows through the open gate, encouraging the last few lost calves along, hoping for momma to come back and retrieve them. Finally, Vernon sent me to the barn to grab a horse, but when I did, I locked Lucas in my car, knowing that extra two miles would wear him out far too much. With all the windows unrolled, he leaned out and woofed mightily as we turned into the field yards from his prison. Good boy that he is, he *did* stay put though! I freed him as again we went through the process of letting the cows sit and bawl and look for their calves, though the majority were simply interested in the lush field, and not their babies! It wasn’t long before a delivery truck came, and we lost Vernon, Daniel, and Brandon to a different job. Johnny and I sat and visited, and I heard more tales from the past… always fascinating to me! Six miscreants edged around the stack yard, knowing in their bovine way, that momma was back a mile, and could not be one of the cows grazing hungrily a few yards away. Lucas and I were on the job! In 2006, when Lucas was run over, he was supposed to do water therapy. They did it at the vet clinic in Billings, but it was wintertime here and the creek was frozen! I tried putting a stock tank in my kitchen with warm water to make him swim, but it wasn’t deep enough and he was NOT impressed. He’s not a water dog except for laying in it, and pretty much the only time he’ll ever swim is if I’ve crossed a creek myself and he must follow. 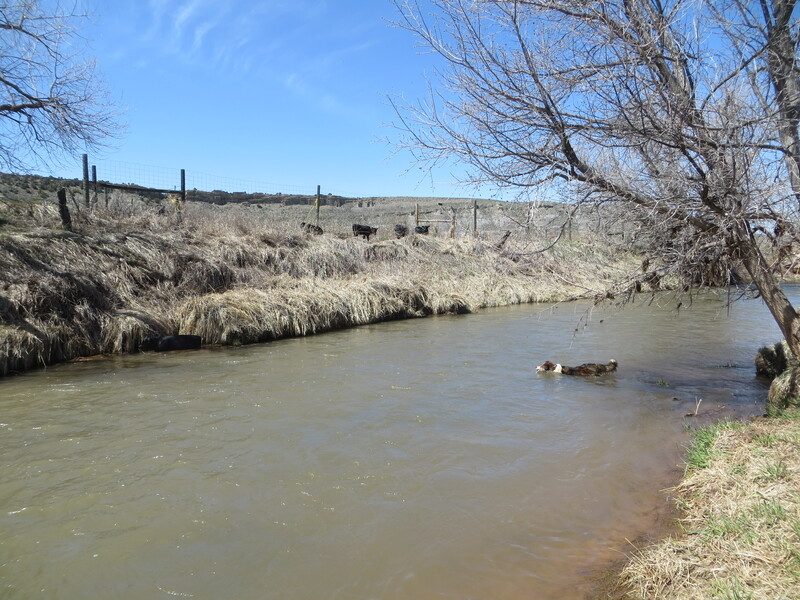 I never thought when I tried to send him across the creek to chase the calves back that he actually would go! But, holy cow! look at him! He’s focused on the calf in the water, right at the edge of the creek in the shadows. The calf knew he was there, and before Lucas made it to him, the calf was inspired enough to climb out on his own. 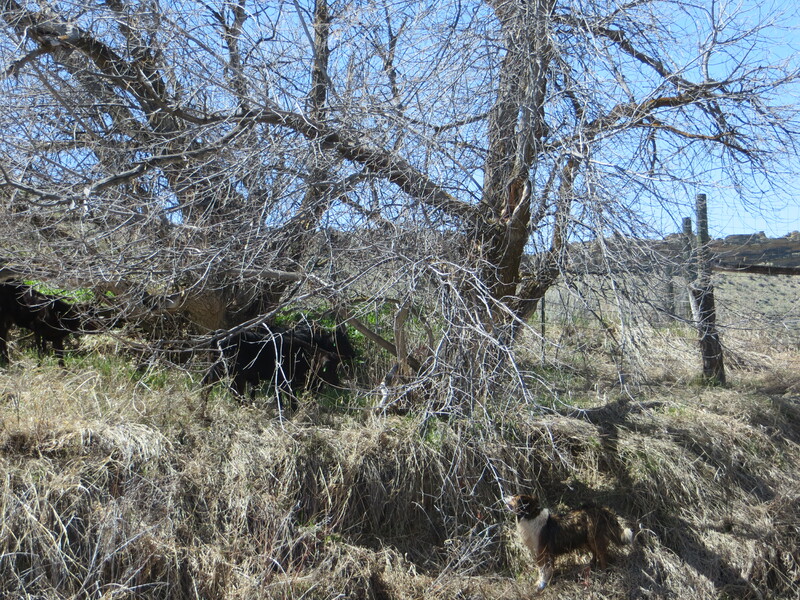 Lucas, though, couldn’t climb the steep bank, so back he came. 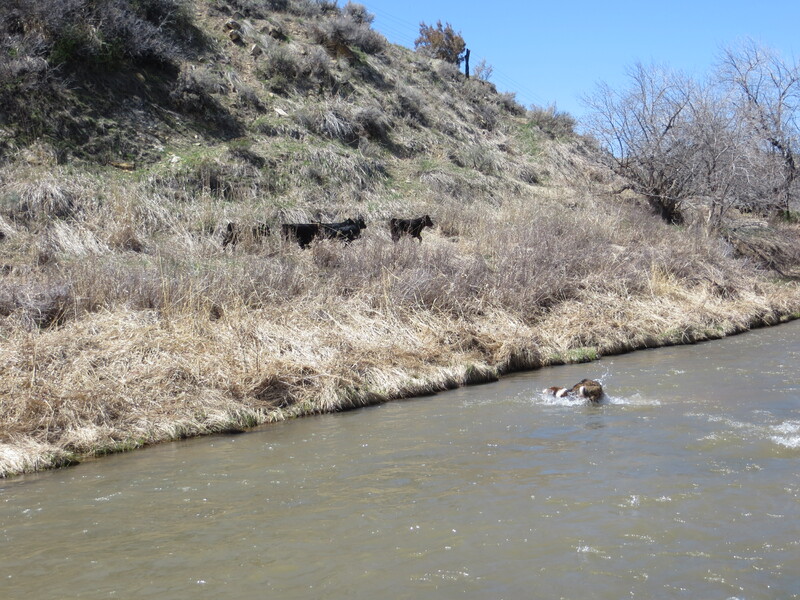 Then the calves tried to cross the creek again. It was shallower here, but there he goes again! Good dog! Not so steep nor slick with the long grass, he was ready to shove them back through the fence and return them to their mothers. A little encouragement to slow him down, and with the pressure off, the calves squeezed back through the fence and returned to the herd. Well… how about that? Sometimes, after all these years, that dog can still surprise me! Good dog Lucas! It must make him so happy when he can work. enjoyed it this ready-made water therapy might be one of his new joys in life! Good job Lucas. What a great cow dog.